This is the summary of consumer reviews for Baby Einstein Bendy Ball. The BoolPool rating for this product is Very Good, with 4.40 stars, and the price range is $5.99-$7.20. 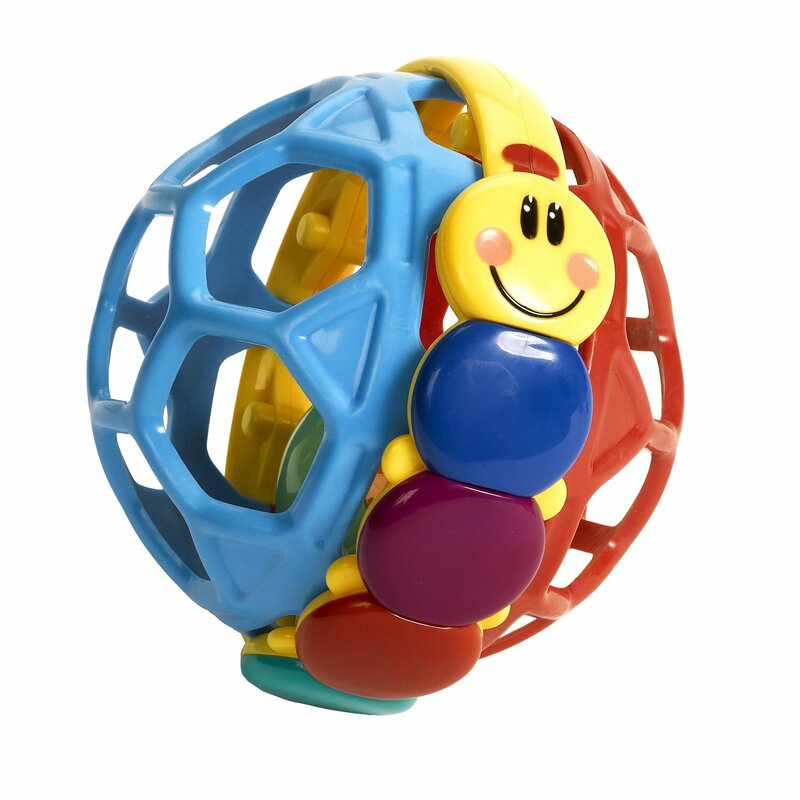 The Baby Einstein Bendy Ball is an easy to hold and grip small ball toy for your little babies. It features bright primary colors and the recognizable Caterpillar character on center band. 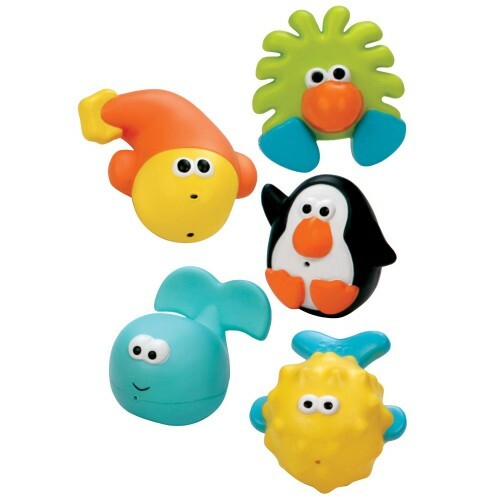 It is made from soft and flexible plastic and is easy to bend, squeeze, grasp and roll. 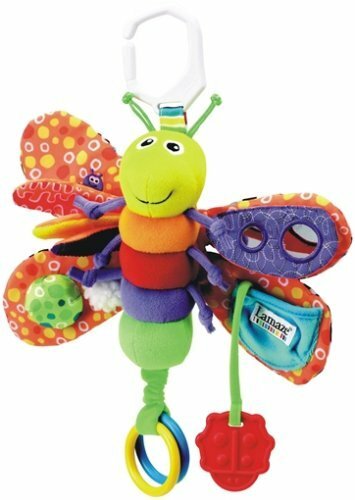 The multi-colored rolling rattle ball inside adds additional sounds and visual stimulation to this toy. This Bendy Ball can be washed in dishwasher. It is an inexpensive toy which can get attention of some babies. Some parents find the Bendy Ball very small and not very interactive. They also complain that plastic is hard and sharp and may hurt the babies. In some cases, parents report that it was easy to get little hands and finger caught inside. 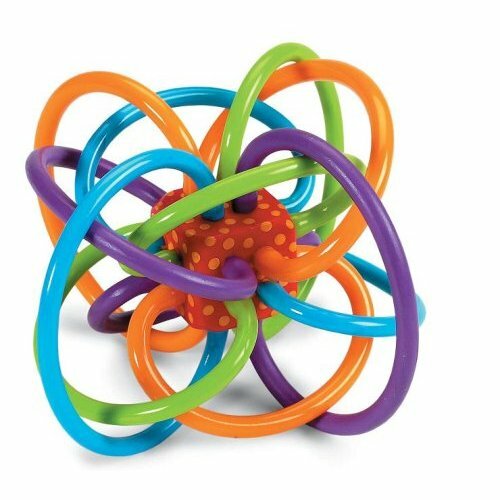 Overall, Baby Einstein Bendy Ball is an attractive, inexpensive fun toy to play with. 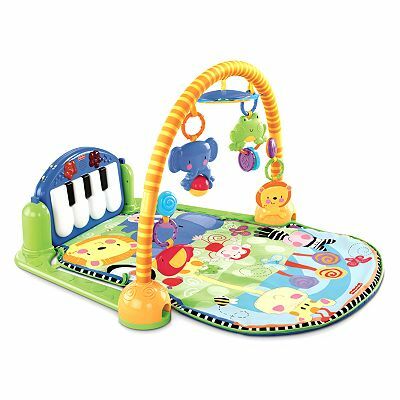 Some babies and parents like it and while some other parents do not rate this toy very high. it's ok ... my son plays with it sometime only. I bought this for my 6 month old son. I saw this at Amazon.com and thought my son would enjoy it. He's only 1 so I wasn't exactly sure what to buy him for Christmas. Be careful when buying this product. The first and only time he played with it, his finger got really stuck in one of the holes by the caterpillar. The ball is HARD and my son repeatedly hit himself in the head while shaking the ball. On many occassions it caused my son to cry and we just ended up taking it away from him. Also, the plastic is kind of sharp when you put your fingers through the holes. 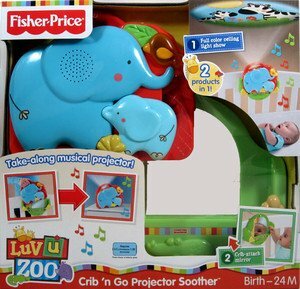 Awesome little toy for babies. My daughter absolutely loves this toy. Washes great in dishwasher :) They love this toy! I was happy to receive the toy after two days of free shipping, and just like the picture online it's a colorful and interesting toy. As soon as I brought it home, she played with this toy only-forget all of her other toys! I bought this toy for my 5 month old little girl while shopping at my local retail store about 2 weeks ago. This's my boys favorite toy! this toy was very colorful and caught the baby's attention from the start. But I thought it was a darling little toy. This toy is very easy to grasp. It's easy to grip for small hands. It's really easy for him to hold with one hand- or both. 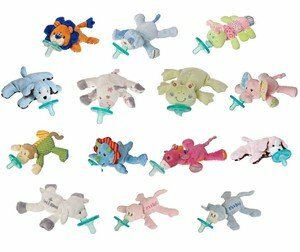 The toy is very easy for baby to grasp with his tiny hands and the design helps it from rolling too far on its own. It's bright and easy to grip. Shape and size make it easy for my 4mo old to play with....yet it also makes it easy to get his hands caught inside. 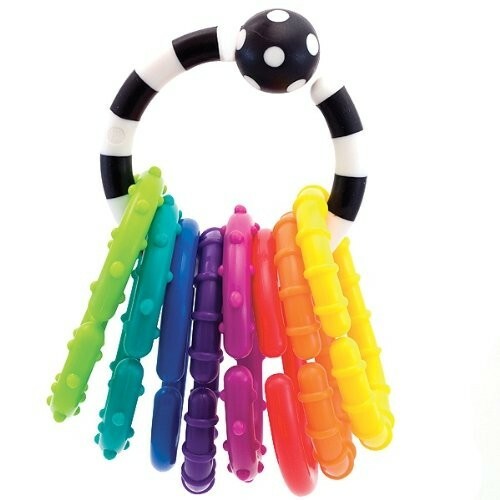 The bright colors and intriguing holes easily made this one simle toy my daughter loved playing with. 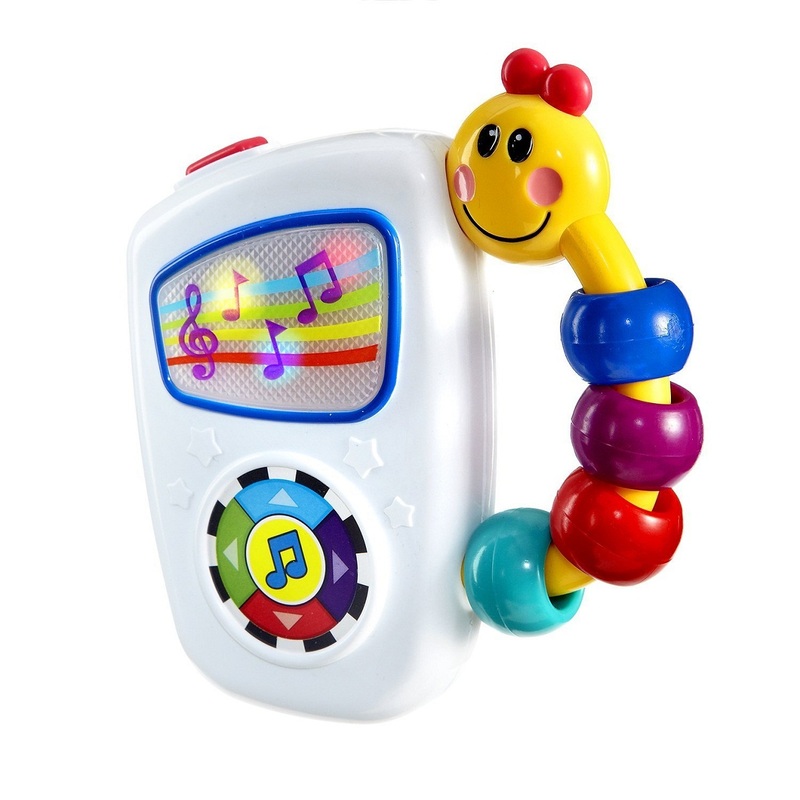 It's too easy for slightly older babies and toddlers to get their hands stuck trying to retrieve the little rattle ball. It rolls just fine and the holes are a bonus making it extremely easy for baby to grab hold of it. I bought this toy unsure if it'd roll well enough. It arrived on time and the little guy just loves it! Very cute though and has a little bell inside so when the ball rolls around, it rattles. Lots of fun for the little ones. I was a little worried this ball would be too big for my little one to handle easily, but it's just the right size for her at 6 months. It's also quite a bit smaller than I thought, but it's a good size for his little hands. Our baby loves it, but it's a little harder than I thought it'd be. I dont think babies can "bend" it and i dont think it's "bendable" either but babies can easily grip it and there's a cute catapillar cartoon in the middle. The little guy I got this for is 8 mos. Plus the ball inside that you can't quite get out has a little ball inside it that sounds like a bell almost. The caterpillar seems to make it awkward and heavy for a little baby. I thought my daughter would be a little old for this toy, but she actually really loves this ball. This was the first toy my daughter really played with and the first she picked up by herself. We introduced this toy to our 5 month old and he really likes it. I bought this toy for my grandson and he really liked it. I like this toy because my almost 6-month old son can easily grab and hold on to it. It's a nice, quiet toy and is easy for a baby to grasp. However, it's really kind of boring, and reminds me quite a bit of a cat toy. I'd hoped all the holes would make it easy for her to play with, but she never really seems to grasp unless i help her. He's many other rattle-type toys meant for grabbing, but this's the first one he's actually grabbed on to and played with.